(Nanowerk News) The research group consisting of Assistant Professor Kenichi Ozawa in the Graduate School of Science and Engineering at the Tokyo Institute of Technology, Associate Professor Iwao Matsuda and Research Associate Susumu Yamamoto in the Institute for Solid State Physics at the University of Tokyo, and Professor Hiroshi Sakama in the Faculty of Science and Technology at Sophia University, discovered through the in situ observation of the behavior of photoexcited carriers1) on the surface of a titanium dioxide (TiO2) crystal used as a photocatalyst2) that the carrier (electron and positive hole) lifetime3) on the crystal surface is an important factor to determine the catalytic activity ("Electron-Hole Recombination Time at TiO2 Single-crystal Surfaces: Influence of Surface Band Bending"). This shows how the surface carrier lifetime of anatase and rutile TiO2 is affected by the surface potential barrier. 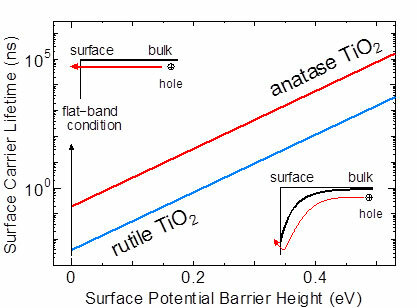 The graph above, where the line of anatase TiO2 is always higher than that of rutile TiO2, indicates that the carrier lifetime of the former is longer than that of the latter at the same magnitude of surface potential barrier. TiO2 has two crystalline forms with different atomic structures: rutile and anatase. Differences in the catalytic activity between the two types were not revealed except that anatase has higher catalytic activity than rutile. The present study discovered that it is because the carrier lifetime on the anatase crystal surface is more than 10 times longer than that on the rutile crystal surface and suggested that more efficient photocatalyst can be developed by controlling the surface carrier lifetime with the chemical treatment of the catalyst surface. Taking notice of the fact that TiO2 has semiconducting properties, the researchers succeeded for the first time in analyzing the dynamical behavior of the photoexcited carriers on the crystal surface by tracing changes in the surface photovoltage4), a phenomenon specific to semiconductor, on a nanosecond basis. The experiment was conducted by using the time-resolved photoemission spectroscopy equipment with ultraviolet laser and soft X-ray synchrotron radiation at the synchrotron radiation outstation beamline "BL07LSU" of the University of Tokyo at the large synchrotron radiation facility "Spring-8." When a semiconductor is illuminated by light with energy higher than its band gap, valence-band electrons are excited into the conduction band, leaving holes in the valence band. These excited electrons and the holes (positive holes) in the valence band are collectively called as photoexcited carriers. It is a substance that promotes chemical reactions when exposed to light without undergoing any change in itself during the reactions. Some semiconductor materials with band gaps have photocatalytic properties. It is defined as a period of time after photoexcited carriers are generated until they disappear. They disappear when electrons and positive holes are recombined. Photoexcited carriers generated on the surface of a semiconductor with surface potential move along the electric field gradient of the potential, which disturbs the charge balance between the surface and inside of the crystal resulting in a voltage difference. This effect is called surface photovoltage.